If you’re responsible for marketing a business, you know that social media is one of your most powerful tools. It allows you to connect with customers, provide them with information about your company, and build relationships that can have a direct impact on sales, customer retention, and brand reputation – all of which are extremely important to your success. But as social media continues to evolve, the ways you use it for marketing need to change too – and that can be a lot easier said than done when the Internet seems to change in the blink of an eye. How can you be expected to keep up? The best way is to watch industry publications, but even that can seem like a lot if social media is only a small part of your job responsibilities. If that’s the case, this post can help get you up to speed – and while I won’t claim that it has everything you need, I’ve included some of the more surprising statistics over the past year that can help inform your marketing decisions. Almost three quarters of adults with Internet access also have at least one social media account, and 52% of online adults use two or more. This means that not only do your current and potential customers probably use some form of social media, but it’s also pretty likely that they’re on multiple sites. So if you’re on the fence about creating accounts on some of the larger platforms, the odds are in your favor that your audience is already there. 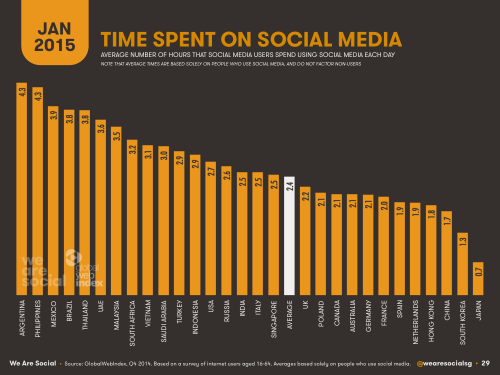 … and the average social media user worldwide spends 2.4. This stat doesn’t require much of an explanation, but it’s a solid reminder of the constant presence social media has in our lives. If you only have the resources to be active on one platform (or if you are just having trouble deciding where to start), Facebook is your best bet. Despite claims that it’s , 58% of American adults use it, making it the most widely used social site by far. Keep in mind that this is 58% of all American adults – not American social media users, or even American Internet users. Over half of the adults in this country use Facebook, which is significant by any standard. 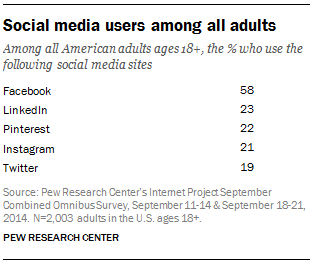 Plus, as I mentioned in the stat above, over half of online adults use multiple social platforms. But of the ones don’t, 79% are exclusively on Facebook. As you weigh your social media options, you likely think of Facebook, Twitter, Instagram, LinkedIn, and maybe Pinterest. But have you considered YouTube? Although you may not think of it as a social platform, it drives more engaged traffic than any other social site. Visitors from YouTube stay on sites the longest, visit the most pages, and bounce less than referral traffic from any other social platform. So even though it tends to drive fewer referrals, you can be sure that with YouTube, you’re getting quality over quantity. 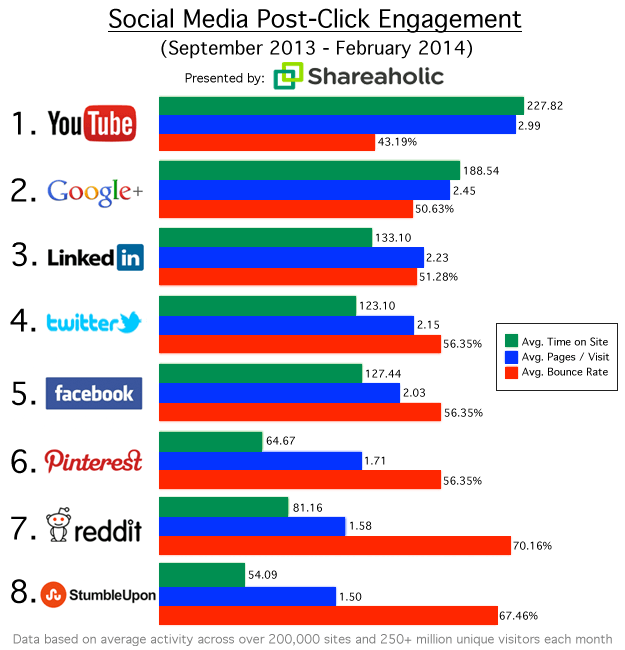 Google+ and LinkedIn also drive highly engaged traffic, while Reddit and StumbleUpon send the least engaged traffic. In fact, referrals from Reddit have a 63% higher bounce rate than referrals from YouTube. So although creating videos requires more time than posting links to a forum, it could be well worth the effort. If you thought that social media was only good for improving brand awareness, you’ll be happy to know that social commerce is projected to reach $30 billion in 2015. That’s a 50% increase over 2014, meaning that social media sales took off over the past year. This likely has a lot to do with all of the new advertising options that continue to roll out for businesses. Facebook, Twitter, Instagram, LinkedIn, and Pinterest all now offer “sponsored” or “promoted” content, and the native format has clearly delivered results. One common misconception about social media marketing is that it’s only viable for B2C companies. And while it takes longer to convince a team of decision-makers than it does one single consumer, it’s important to remember that ultimately, those decision-makers are still consumers – consumers who are likely on social media. If you’re a B2B marketer, you need to be on LinkedIn – it’s as simple as that. Considering that 4 out of 5 B2B social media leads come from the platform, it’s the obvious choice for companies that want to test out social media marketing and a no-brainer for those who have the resources to invest in multiple. Plus, now that 50% of Internet users with a college education are members, it’s an invaluable recruiting tool for companies looking to hire tech-savvy employees. Despite the clear benefits of social media, it’s often an afterthought for companies who don’t take it seriously as a marketing tool. In fact, only about a quarter of companies integrate it into their marketing plans. As someone who has witnessed the results of a solid social strategy firsthand, it’s hard for me to believe that so many companies are missing out the potential benefits. But if you’re on the fence about investing in social media, this is good news – simply integrating it into your business’s overall marketing strategy could put you ahead of 74% of your competitors. Social media is a part of most consumers’ daily lives, and from the looks of it, that isn’t changing any time soon. As a marketer, that means that utilizing it as a tool isn’t really optional anymore – it’s absolutely necessary. At the very least, B2C companies should be on Facebook and B2B companies should be on LinkedIn. And while the statistics above can help you make informed decisions about how you use the platforms, the best way to grow your business with them is simply to use them. Did any of these facts surprise you? Have you seen any other surprising social media marketing stats lately? Let me know in the comments below!